The sun rose in Barrow at 8:30, and we came out with it. Our car's windshield was covered with ice, and the temperature hung just below 30°. 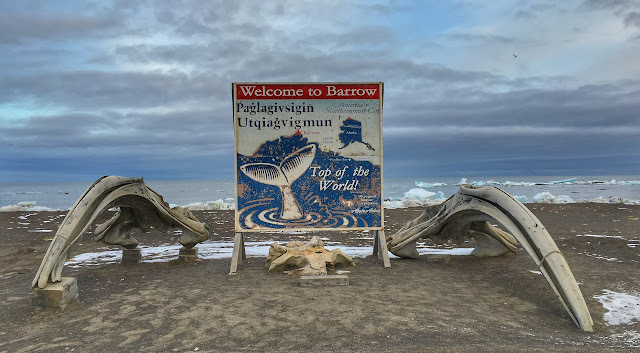 We started the day driving out Stevenson Road toward Point Barrow, the northernmost point in the United States, passing the site of yesterday's whale activity. 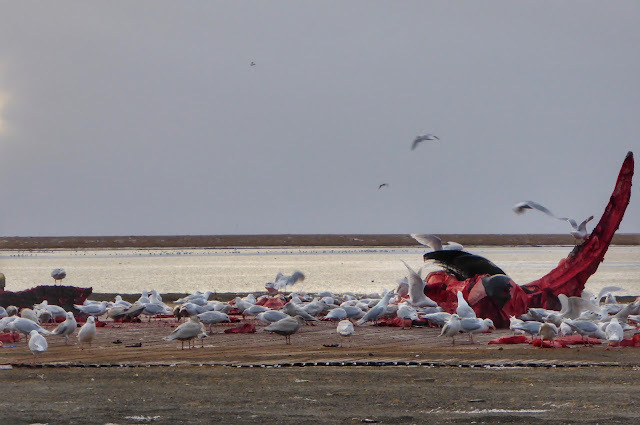 We were hoping a polar bear or two had discovered the remaining carcass, but instead a large flock of seagulls feasted on the residue. After the animals have harvested all they can, the bones will be returned to the sea to set the whale's spirit free. Only bones which wash up on the beach later can be used for local arts and crafts. SEAGULLS CLEAN UP LIKE THE SCAVENGERS THEY ARE. 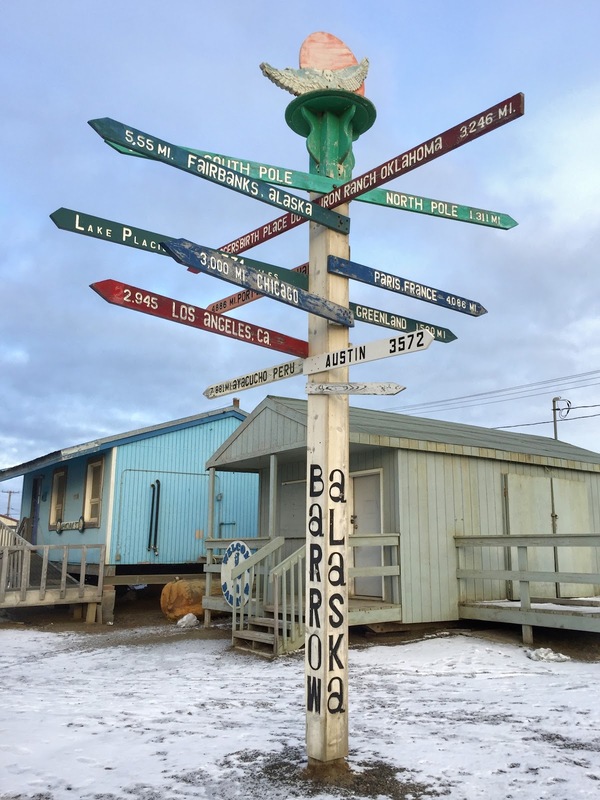 Our plan was to continue to the end of the road to search for a letterbox planted there, but as we rode, we realized that life at this remote Arctic community is so different from our familiar lives, we were seeing things we didn't understand. That's when we decided to check into the guided tour of the town that we had read about. Thinking we could book it through the local tourist information office, which we vaguely remembered was across from the airport, we headed in that direction. 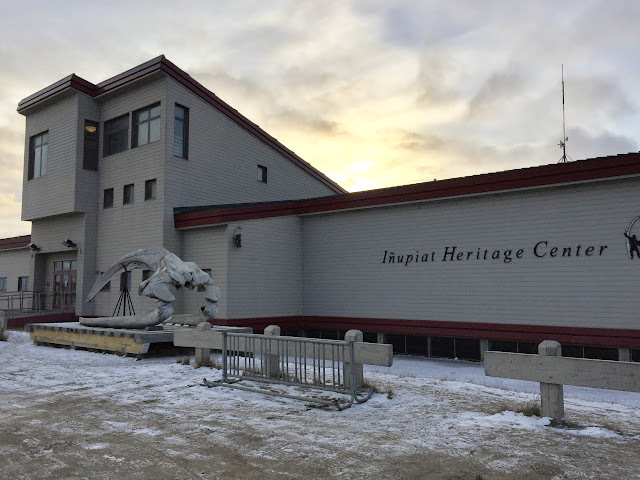 When we arrived, the modest frame building was padlocked shut, so we decided to try the Iñupiat Heritage Center in the center of town. TINY TI (BEHIND SIGN) WAS LOCKED UP TIGHT. When we asked about the tour, the friendly greeter Joan at the desk told us about Tundra Tours operating out of the Top of the World Hotel. With that info in hand, we decided to check out the heritage center's exhibits while we were there. Being over 60 years old, we both qualified as "elders" so admission was free. Before we could get started with the exhibits, we pelted Joan with some of the many questions we had about the whaling activity we had seen last night. After trying to answer our eager inquiries, she finally paused to suggest that the we check out the center's whaling exhibits and then bring her any questions we had left unanswered. 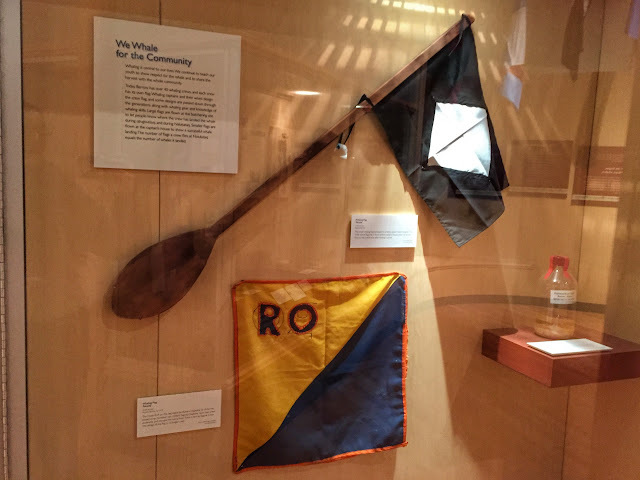 Joan was right; the exhibits answered all our questions and more. We learned that the Iñupiat have been living along the Arctic coast in semi-permanent communities near favorable hunting spots for about 4,000 years. Over the course of hundreds of generations, these hardy people have developed sophisticated knowledge of the animals they hunt and mastered precision skills still in use today. Whaling is a central influence in the people's lives, and they continue to teach new generations the knowledge and skills of subsistence whaling. 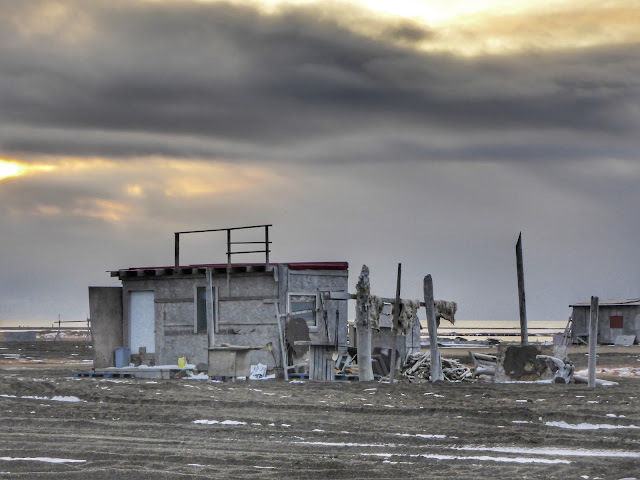 The North Slope Borough responded by commissioning scientific research to document Iñupiat knowledge of the bowhead as well as its cultural, nutritional and spiritual importance to their society. Their research also demonstrated that the population was more robust than the commission's data suggested. 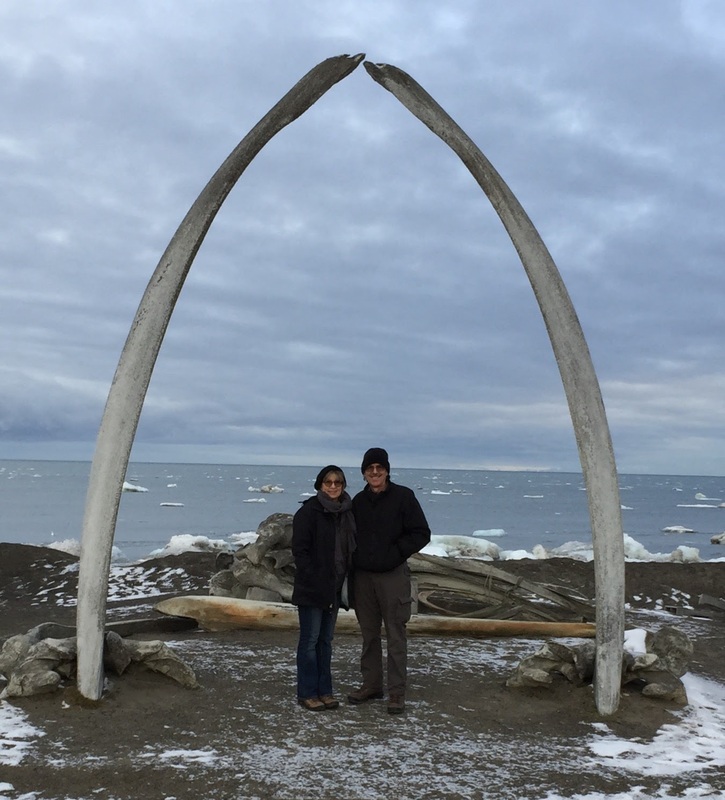 The following year, the IWC established a quota system for subsistence whaling in Alaskan Native communities of the North Slope. THE TYPE OF ALUMINUM BOAT USED FOR FALL HUNTING, FLYING THE WHALING CREW FLAG. 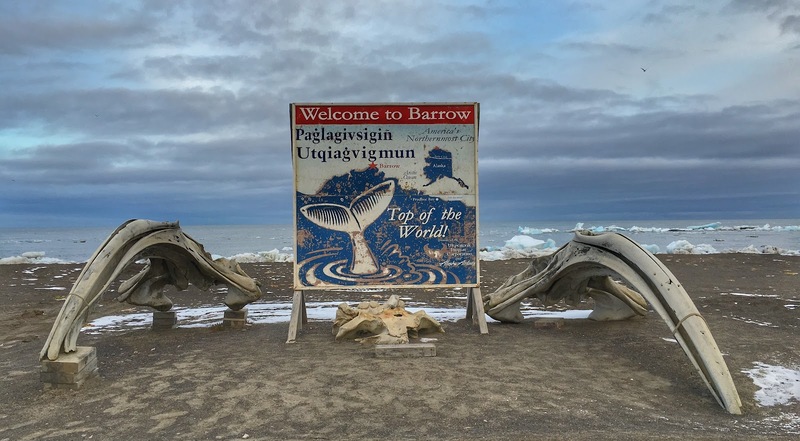 Today about 40 whaling crews operate out of Barrow, each with its own flag. Whaling is a group effort, approached with dignity and respect for the whale. 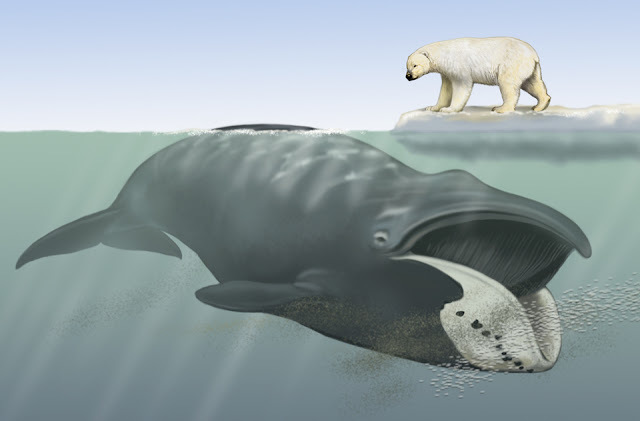 Iñupiat believe that a whale gives itself to them if the whale finds that crew worthy. Hunting techniques emphasize a quick and humane kill, and crew members maintain a solemn attitude while the whale is dying, demanding silence. In respect to the whale's spirit, no expression of joy for the harvest is permitted until the whale is dead and the crew has surrounded the whale and said a prayer of thanksgiving for the gift they have received. By noon, we had made our way to the hotel and reserved spots on the 12:00 tour. As it turned out, we were the only passengers in the tour van with our local driver/guide, "John." 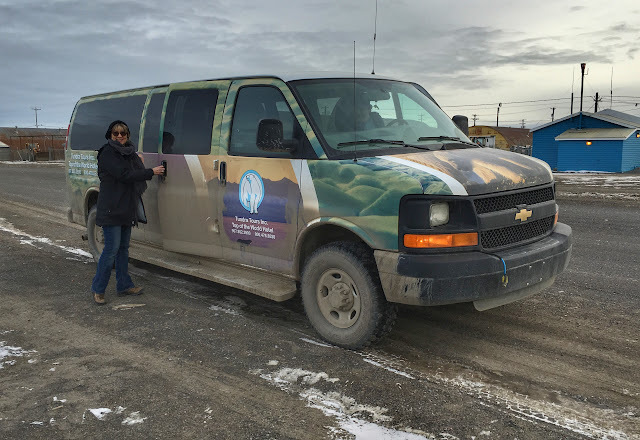 Like every other vehicle in town, the van bore a thick coat of dust, inside and out. A dutiful host, John drove us past every possible building of note in town—the "new" high school (opened in 1985) and the old high school, the new hospital and the old hospital, etc. Finally after three and a half hours, we insisted (not for the first time) that he return us to the hotel so we could retrieve our rental car. Shortly before we both would have begun drooling and mumbling incoherently, we made our escape. Though he was very patient and no doubt had the best of intentions, John, following the script he had been given, told us very little about the local way of life unless we probed him with questions. At $100 per person, it was for us a disappointment, for the tour company, a missed opportunity to educate visitors. One of the few interesting stops we made on the tour was at the home of John's cousin, a whaling captain whose crew brought in the whale yesterday. By local tradition, the day after a successful landing, the crew flag flies over the captain's home to notify the community of the place to come and share in the first meal from the whale. The choicest parts of the whale are boiled and served up. The remainder of the captain's share is put in cold storage and part will be used later for other community meals at Thanksgiving and Christmas. We were offered a sample of fresh maktak, skin attached to a trimmed layer of blubber. A very popular treat locally, it was something we were glad vegetarianism gave us an excuse to decline. FIND THE GRASS PAST WHERE THE SIGN USED TO BE, THE CLUE ADVISED. 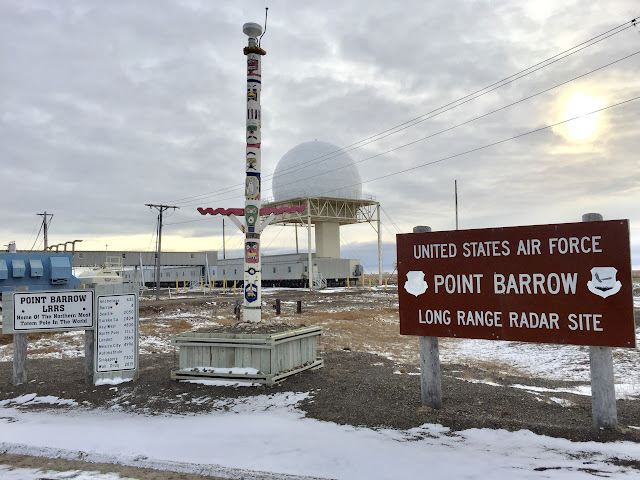 Back in our own vehicle, we made haste to Point Barrow, ten miles north of the town and the northernmost point in Alaska and the U.S. Two years ago, a geologist doing work in the area hid a letterbox there. Having read the clue in advance, we figured we had as much chance of discovering a crocodile hanging out there as we did of locating this letterbox. Somehow with an uncanny combination of intuition and luck, Ken dug the box up. Vehicular traffic over the grass had shoved the box several inches below the sand, but he had the box in hand in about five minutes. NEVER ACTUALLY EXPECTING A FIND, THE BOX OWNER WAS THRILLED. After logging in, we headed back toward town to plant a box of our own. The spot we had picked out was Cathy Parker Field, home of the Barrow High School Whalers. 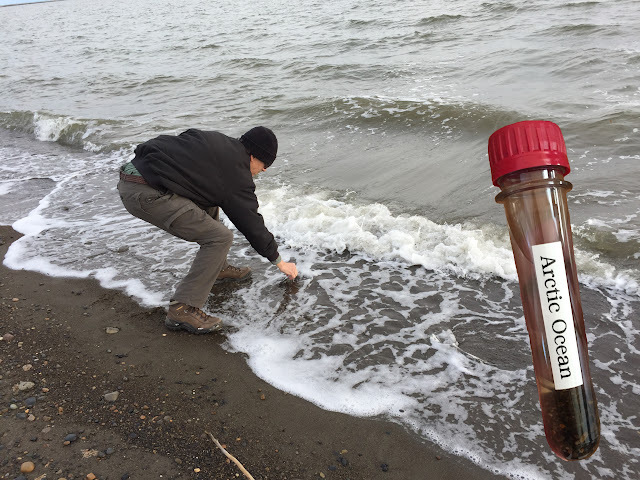 Before driving the six miles back to the field, we wanted to collect a sample from the Arctic Ocean out where it was easy to approach the water. Recently we had purchased some soda bottle preforms (plastic test tubes with caps), thinking they might make good letterbox containers. When they proved unsuitable for that, we decided to start a collection of waters of the world. Though the tube is 4½ inches long, the walls are thick (why it couldn't be used for a letterbox) so it holds only one ounce of water, well below TSA's 3.4-oz maximum. IF YOU WONDER WHAT WE WILL DO WITH THESE WATERS, SO DO WE. 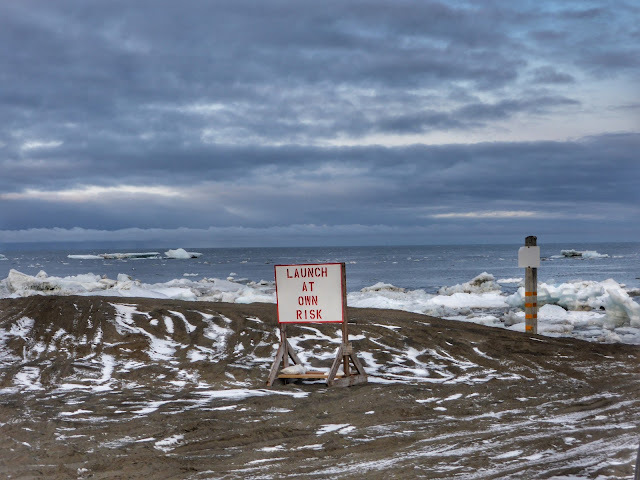 Continuing south on Stevenson Road toward Cathy Parker Field, we noticed five small aluminum boats fanned out and jointly tugging a submerged cargo toward the shore and knew one of the two whales landed today was about to reach the beach. News travels very fast in Barrow as it is broadcast on a local VHF radio network. According to tour guide John, most homes and businesses have receivers and monitor them. By the speed that yesterday's polar bear sightings (mother and two cubs) and the whale catches spread around town, the system is very effective. And that was why a group of people were gathered on the shore to watch the arrival. We stayed also to observe this important community event. BARROW HIGH WHALERS PRACTICE AT CATHY PARKER FIELD. At last we made our way to Cathy Parker Field, where the Whalers of Barrow High (enrollment: 206) were engaged in an after-school practice session. 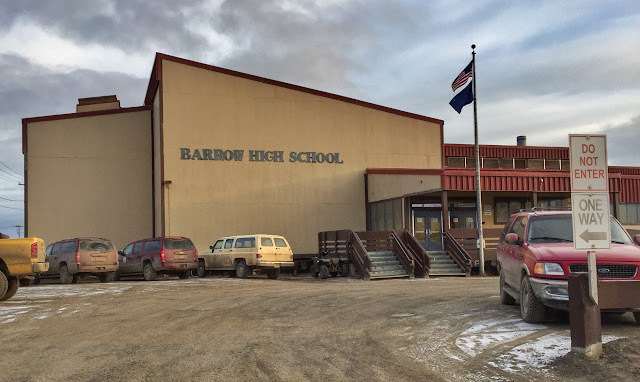 If this seems an odd name for the stadium of a school with 92% Alaska Native enrollment, you haven't heard the story of Cathy Parker. Concerned about student drug use and a high drop-out rate, Barrow High officials decided in 2007 to start a football program to try to motivate teens to stay in school. Only wiry tundra grass will grow this far above the Arctic Circle, so players learned the game of football on a rock-strewn dirt field with yard markers lined in flour. WILDLIFE OFFICIALS PATROL DURING GAMES TO PREVENT POLAR BEARS FROM ENTERING FIELD. After an ESPN reporter heard about this venture, the network broadcast a piece about the team, and that's when Cathy Parker entered the picture. A Jacksonville, Florida mother of high school football players, she took it upon herself to help the Barrow Whalers. 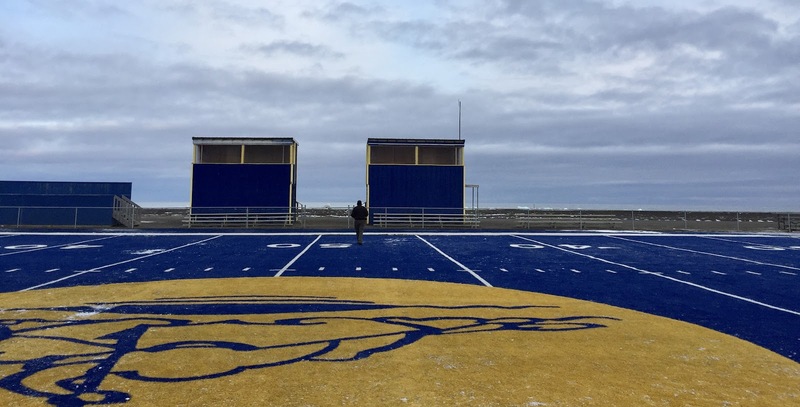 Over the course of a year, she raised almost $1 million to have the blue and gold artificial turf field manufactured and installed across Stevenson Road from the Arctic Ocean. So, of course, the field bears her name. A movie retelling this heart-warming story—Touchdown on the Tundra—is currently in production and is scheduled for release in 2017. EVERY FIELD SHOUD HAVE A SPECIAL SHELTER FOR ELDERS, YES? While the players were listening to their coach and engaged in drills, we slipped behind one of the two press boxes (made from shipping crates) and hid our letterbox. In keeping with local customs and respect, one of the press boxes is for media, the other is for elders to watch the game in comfort. At the airport—another single-gate terminal—we encountered a different setup to meet security requirements. Only after passengers were called to board did we go through TSA screening on our way to the tarmac. It was very efficient, and by 6:45, the 7 p.m. flight was taxiing for take-off. As we gazed out the window, we felt a bit wistful, almost wishing we had planned to stay longer, yet thankful for a full and fascinating 23 hours in America's northernmost town. 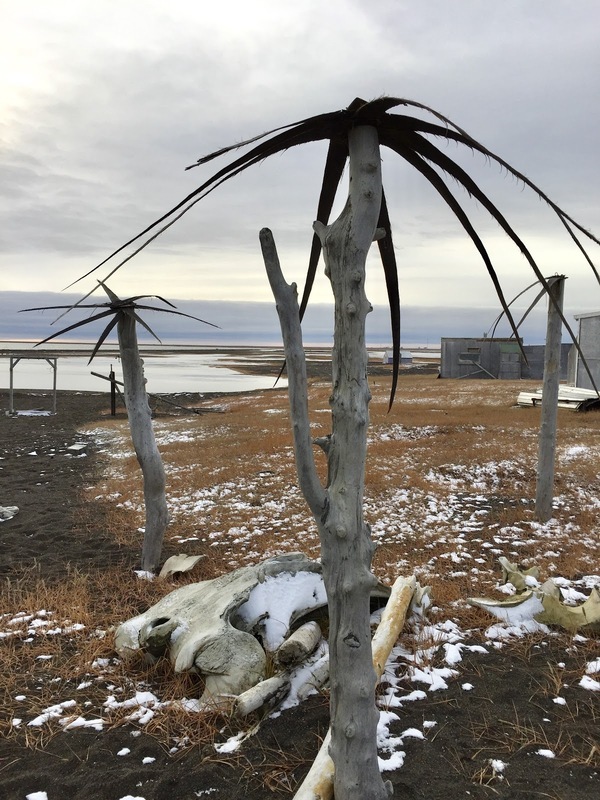 NOTE: In October, 2016, the citizens of Barrow voted to change the name of the town to its traditional Iñupiat name–Utqiagvik (oot-kay'-ahg-vik), which means a place for gathering wild roots. The change was to become effective in November. TYPICAL HUNTING HUT AT PIGNIQ STATION, THE BASE FOR SUMMER DUCK & GEESE HUNTING. 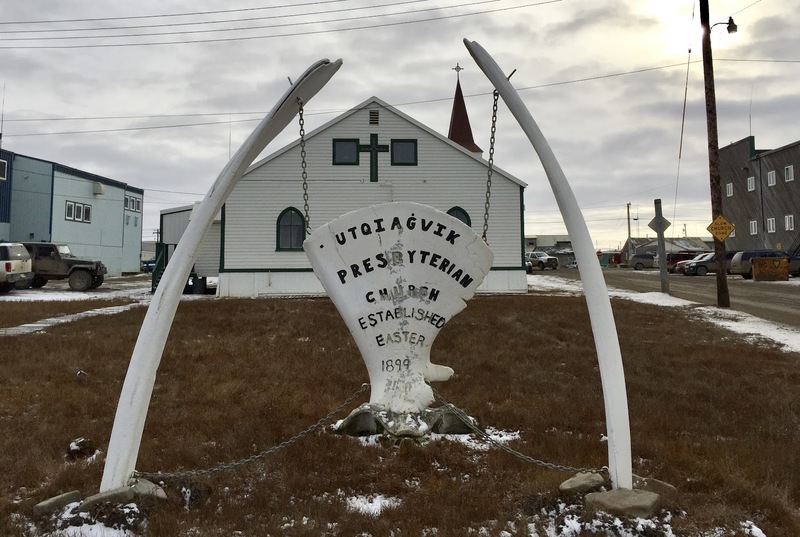 BOWHEAD BONES FLANK THE TOWN WELCOME SIGN ON THE ARCTIC SHORE. THE AIRPORT RUNWAY IS THE ONLY PAVED AREA IN TOWN. BOWHEAD JAWBONE ARCH ON THE ARCTIC DATES FROM LATE 1800S. 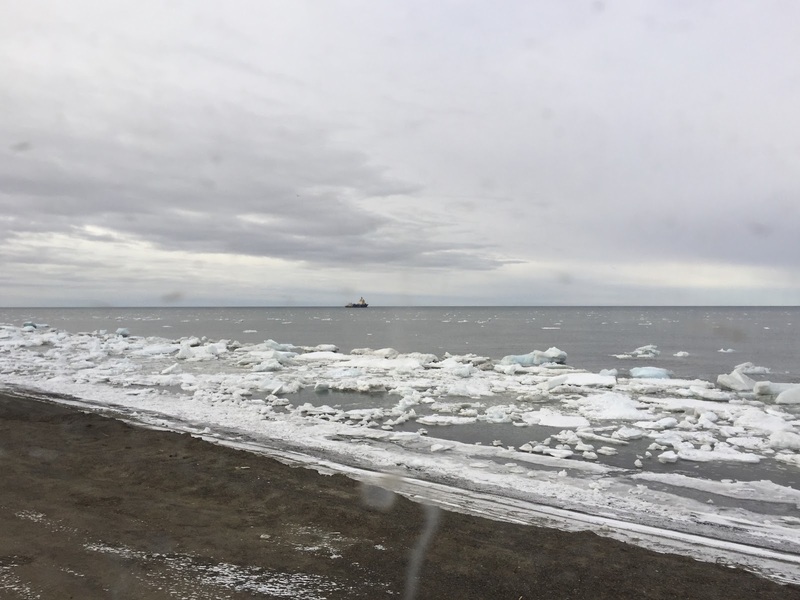 EVEN IN SEPTEMBER, PACK ICE SITS OFF SHORE AND FURTHER OFF AN ICEBREAKER SHIP. 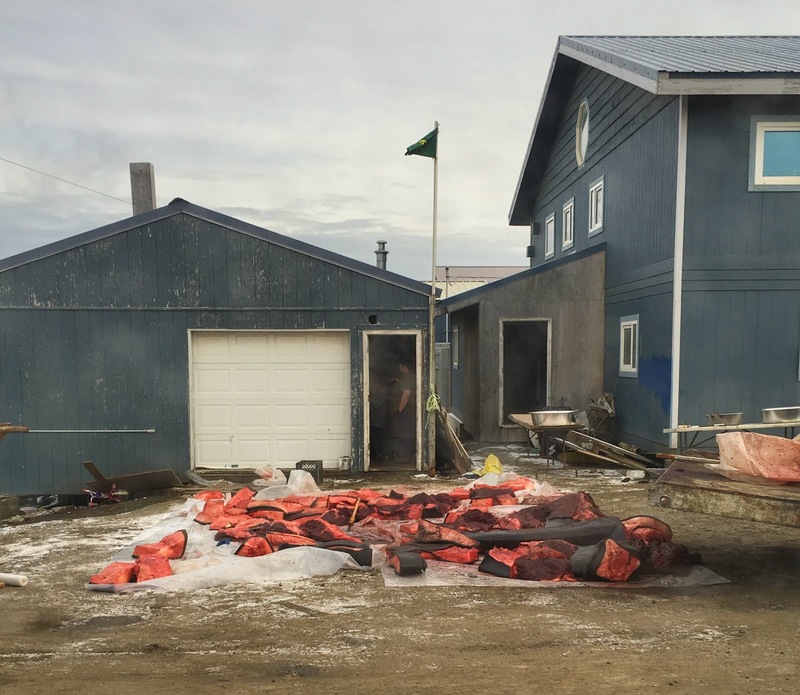 THE SCHOOL SITS ON PILINGS TO PREVENT HEAT TRANSFER TO THE PERMAFROST. HOMEGROWN SIGN WHERE THE ONE FROM THE EMPTY FRAME WAS.